The highest-rated chess players of the present time, the winners of the recently held big international tournaments have arrived to the capital city of KBR. I would like to gladly emphasize that Nalchik is becoming one of the centers of the world chess development. Last year we have successfully held here the World championship among women, we are currently holding Grand Prix tournament. And if before the beginning of the last year's championship even the leadership of FIDE searched for the place name of Nalchik on the map, today many millions of world chess players know and love the capital of Kabardino-Balkaria, - Kirsan Ilyumzhinov underlined. He also informed that there has been reached and agreement with the leadership of KBR, on introducing chess into school program starting from September 1st. KBR President Arsen Kanokov thanked FIDE leadership for having chosen Nalchik as a place for Grand Prix tournament and pointed out that after the World chess championship among women, the inhabitants of Kabardino-Balkaria took great interest to chess playing. - I travel much about the republic and I see, - he said, - the way our children began to be engaged in this intellectual kind of sports, even in the village chess clubs and children's hobby groups are functioning. Hopefully, one day an inhabitant of Kabardino-Balkaria man or woman will become world champion in chess. The chief arbiter of the tournament of Vjachevlav Namruev held a draw ceremony of the participants. The process appeared entertaining and beautiful. 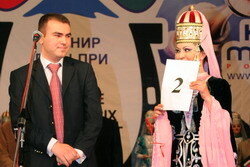 Each of the players lead out a woman dancer of local ensembles "Kabardinka " and "Balkaria" holding a sealed envelope with the number of a chess player. 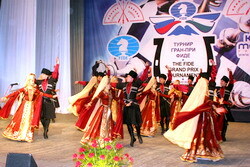 The official part was followed by a concert program of the best singers and dance groups of Kabardino-Balkaria. The first games of the tournament begin tomorrow at 15.00.